We chose him - after a succession of Presidents: Jefferson, Lincoln, Teddy Roosevelt and Kennedy, as well as explorers Lewis and Clark and inventor Ben Franklin - because he represents a vital tradition in American politics and culture: the comedic commentator on serious matters, the funnyman as our collective conscience who can utter uncomfortable truths that more solemn critics evade. In an election year when so many Americans are getting their news from nontraditional sources, Twain is the godfather of Jon Stewart and Stephen Colbert as well as the comic voices who influenced them, from Lenny Bruce to Richard Pryor to Kurt Vonnegut. And Twain, with Adventures of Huckleberry Finn, created the literary dna that helped shape race relations in America over the past century. 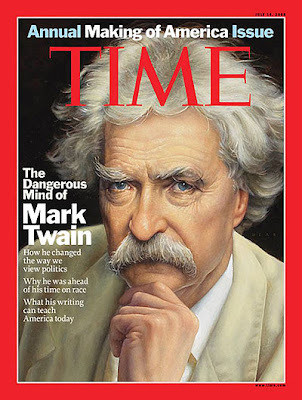 Inside, Richard Lacayo profiles "The Seriously Funny Man"; Roy Blount Jr. examines "Mark Twain: Our Original Superstar"; Stephen L. Carter considers the racial dimensions of Twain's work in "Getting Past Black and White"; Jackson follows Twain's travels in "Man of the World"; and there's a series of portraits here. Don't rush out to your local newsagents, however - this is the US edition only. It's Independence Day (as well as being a UEA Open Day, so hello if you attended). You can see how we marked the day last year, here; alternatively, the New York Times has a variety of articles about this year's celebrations here. 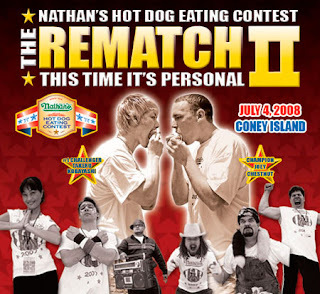 Yardbarker gives you the basics: "All You Need To Know About the 2008 Nathan's Hot Dog Eating Contest"
Time provides "A Brief History of Competitive Eating," and looks back to the first Nathan's contest in 1916. The Wall Street Journal goes "Inside the Belly of Competitive Eating", which includes an interview with Marc Levine, author of an article in the Journal of Roentgenology: "Competitive Speed Eating: Truth and Consequences"
For Slate, Jason Fagone examines "The past and future of competitive eating injuries"
The Brooklyn Angle, meanwhile, is annoyed that Kobayashi has received a "sponsor's exemption" to the event. Food blog Beef Aficionado profiles the Nathan's Famous hot dog itself. Serious Eats offers up a bar graph of Nathan's eating history. The Village Voice profiles competitive eaters Eater X and Crazy Legs. Gothamist provides pictures of the weigh-in, yesterday. And finally, for now: Master of ceremonies and competitive eating personality George Shea is an integral part of the event, known for his rhetorical flights of fancy. Foreign Policy has an interview with him here (registration required). A sample: "The Nathan’s hot dog-eating contest and the International Federation of Competitive Eating (IFOCE) are kind of like a new United Nations, bringing nations together in peace." We'll update with news (and footage) of the winner later. Meanwhile, what's to be made of this kind of contest in a climate of rising food costs and food shortages? Our move is basically premised upon being able to do more of what we already do, just with a few more bells and whistles. But really, just a few. Our skimpy link list is growing, slowly. Today, we're profiling a very worthy addition to the list. The neatly titled Steamboats Are Ruining Everything is a blog run by Caleb Crain, author, amongst many other things, of American Sympathy: Men, Friendship, and Literature in the New Nation (Yale, 2001). Crain touches on a number of subjects that will be of interest to those in and around AMS, particularly those with antiquarian leanings, and he's got a great list of links for finding nineteenth century material online. Today, however, we're highlighting an essay with more modern concerns, even if its core theme (the interpley between technology and literature) has a variety of earlier analogues: "How Is The Internet Changing Literary Style?" Canada.com hosts a Canada Day quiz. Earfarm.com has compiled a Canada Day musical mini-mix. Chasing Ray celebrates "Literary Canada in General and Pierre Breton in Particular." Serious Eats talks about Canada Day food. Wired.com profiles "a few Canadians who have helped contribute to those things that Geeks hold dear." The Calgary Herald ponders, and laments, the symbols of Canada's national identity: "Oh, Canada. You're 141 years old and the best descriptor we have for you is hockey? Or the beaver? Ouch." If you're an AMS student currently enjoying Canada Day, why not let us know how you're marking the occasion?